Marine grade stainless Steel ferrules & crimps, ideal for forming eyes & stops on stainless steel and galvanised wire rope. The size of the ferrule you choose relates to the wire diameter. So, If using 4mm wire rope, please choose a 4mm ferrule. 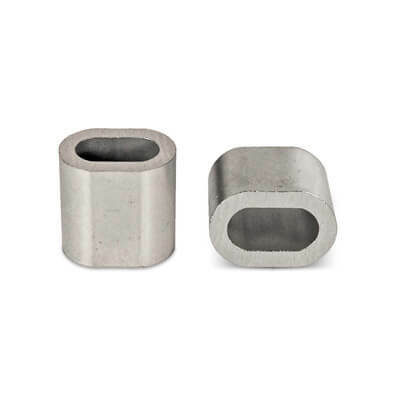 Stainless steel ferrules are very hard, we would recommend using a hydraulic crimping and swage tool with the suitable size dies. Stainless Steel ferrules & crimps manufactured from 316 (marine) grade stainless steel, to offer superb corrosion resistance. 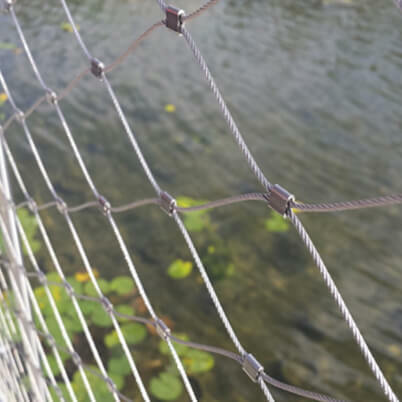 Suitable for architectural use on balustrade wire and fencing wires. Also known as stainless steel wire rope sleeves, compression sleeves and cable crimps. Stainless steel ferrules available to fit 1.5mm, 2mm, 3mm, 4mm, 5mm, 6mm, 8mm and 10mm wire rope. Sizing is like for like. E.g. 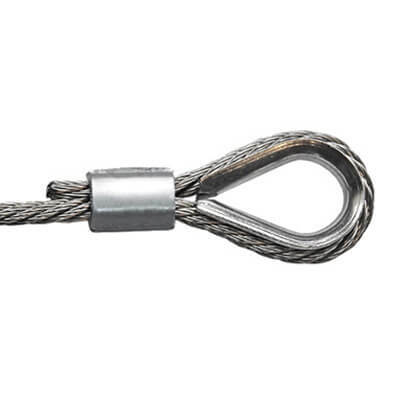 Choose a 4mm Stainless Steel Ferrule to suit 4mm wire rope. How to create a simple soft eye wire rope loop. Simple soft loops can be added to stainless steel wire by placing the stainless steel ferrule over the end of the wire and looping the wire back on itself, passing back through the stainless steel ferrule. Once in place use a swaging or crimping tool to compress the stainless steel ferrule until it holds the wire firmly. Creating a hard eye loop using a thimble with a stainless steel ferrule. Simply lace the dead end of your wire rope through your stainless steel ferrule and loop the end of your wire rope around the outer groove of the thimble. Pass the end back through the stainless steel ferrule and pull-in the dead end to fit tight around the thimble. Once in place, we recommend using a Hydraulic Crimping Tool to compress the stainless steel ferrule firmly onto the rope to hold your thimble loop securely. Once fitted we recommend you load test your wire rope assembly with a load that is equal or greater than the expected load to ensure that your loop/eye performs safely. The product was fine. The annoying bit is being hassled by email to review a non-mechanical fitting worth a few pence. Stainless Steel Wire Rope - Choice of sizes, lengths and grades. Stainless Steel Thimble Eyes to create the perfect reinforced eye loop. Wire Rope Sling with Hard Eye - Made to measure. Wire Rope Crimping Tools for splicing and swaging wire rope fittings.